St Thomas’ Roman Catholic Church, Port Clarence. Officially opened 6th November 1900 by Reverend Dr Preston, auxillary Bishop of Hexham and Newcastle, dedicated to St Thomas of Canterbury. Seating accomodation for approximately 1000 people. The architects were Pugin and Pugin and the building contractor Bastiman Bros of Middlesbrough. This entry was posted in Church and Religious by Picture Stockton Team. Bookmark the permalink. Can you tell me what happened to the bell? There is a local group that posts and chats about their communities… St Thomas Port Clarence was a big part of our community and people asked did anyone know what happened to the bell maybe you can help us. I was born in 10 Bilsdale Grove, went to St Gerards and St Micks (just for a short time). Love to hear from anyone that lived in Bilsdale Grove. I remember the Wards, the Finches, the Wills, the Nightons, the Deerys, the Tingles, the Philips, the Donlasons, the Kings, the Higgins and a lot more. Just love to see some pics of the old place. I know I have lost a few good friends which I see every time I go to my brothers grave (my brother Matty) RIP. There certainly was, fourteen in all counting Mam and Dad. Two additional girls Anne and Pat. Pat was the teacher at St.Thomas prior to emigrating to Australia, Anne lives in Taunton. Sabina sadly died of MS in 2000. Francis still lives in Billingham. I remember the Muckians very well as a child. Joe, one of the sons I think it was, who was a long distant lorry driver. As a young lad he used to give me sixpence every Sunday to deliver a letter to his future wife. Years later she reminded me of these letters and that Joe would also include the couples savings. I really looked forward to that sixpence every week. Funny what sticks in your memory. Where and how is Chris? He worked with me at ICI Billingham. Did you play football for me with Synthonia Juniors? I was Anne-Marie Teasdale, and was in your class, I was the ONLY only-child in the world then I think, (and one of the few who came to the school from Billingham) and left in 1966 to go to the convent. Remember Lawrence Boynton very well, and Eddie Salmon, Sue McGee. Sharon Burnham. You’re remembering Margaret Tasker (now Hayden) and we are meeting up on Saturday next, first time in 25 years. I live in Leicester, Margaret lives in Norton. Hi Sean its many many a year since I have seen you. My mam Catherine Duffy (your aunty) well I’m the youngest Deborah (Jarvis). Aunty Pat always told me I reminded her of your oldest daughter. My brother John Jarvis has lived all over the world like yourself, he is a chemical engineer, now in Dubai. I know he has been doing a family tree I will have to ask him. I hope you’re all keeping well. I have very happy memories of Port clarence where I would spend my summer holidays with relatives after moving from Laburam Grove in 1943. I was baptized at St Thomas’s in 1939 and remember going to mass there with my cousins each summer, I remember Fr Beardsworth also. My mother name was Eileen (Aileen) Dodds nee Cogan and my relatives were the Fairweathers, Burnhams, Kernans and Rowden. I have lost touch with all of my family from Port Clarence so would love to find anyone who has information. Hello Lorna,I am Veronica Johnson now, I was Burnham, from Port Clarence. I do remember you, I remember you came to visit my nana Mary,when her sister, I think aunty Kitty came from Canada. My mam was Jean Fairweather, dad Tommy Burnham, sad to say they are all gone now. I live in North Shields now,but still go home to visit family still in the area. Sadly we lost Eileen two years this September ,a great miss as they all are. I do hope you get this message,I stumbled on this site by accident a few years ago,and check it out now and again. Regards to you and your family Veronica. Hello Lorna. Shaun Rowden here. Hope you are well. If you email the Picture Stockton team: pictures@stockton.gov.uk, they will forward on my email address and I’ll send you some information regarding the Cogans from Kilkenny. My dad Thomas Daley attended this church and must have been a pupil at St Thomas’s school around 1936 to 1945. He always described the Port Clarence people as ‘the salt of the earth’. I wonder who his neighbours were when he was a child and also which road he lived on. I remember him singing ‘Early one morning just as the sun was rising’ learnt at St Thomas’s school and he loved all the Marian hymns particulary ‘I’ll sing a hymn to Mary’. Shame he never lived to see his twelve lovely grandchildren. Did anyone know the Daleys? I knew Tommy Daley very well, he was born in September, 1931. And I was born in September 1932 so he was in the class above me at School. Tommy and I played football for Port Clarence and I have photos of the team(if any body wanted a copy I could send them one by e-mail. I also knew Luke and Bob and I knocked about together when we were at school. I occasionally see Theresa in Billingham. Tommy worked in the Shipyard at Haverton Hill but left to work with me at ICI Billingham. Hello, it would be great if you could email me all photos containing my dad Tom Daley – thanks. Claire (one of his 4 daughters). Please ask Picture Stockton for my email address. Hi I am one of Tommy Daleys four daughters Margaret and would love any photos. If you contact Picture Stockton they will forward you my email address. I married Alice Hills son Tony Hill. I was born in 2 Sycamore Terrace on the 21st November 1947 and was christened in St. Thomas’s. Yes the benches went to St. Joseph’s on Low Grange Avenue, Billingham. In reply to deborah crooks; Charlotte and Thomas Wells were my Grand-parents. I know the Crooks family from Braid Crescent, Billingham very well. I am now living in Yarm. My goodness, I’m so sorry to have only just found this message. I’m married to Peter Crooks, his parents were John and Mary. Charlotte was Johns aunty, I think… her brother was Thomas William Crooks, he married Annie Wells, Thomas Wells relative. Do you have any other information you could share please. Looking for any info on Mary Ann Crooks nee Burley, who was Charlottes mother. We are living in Thornaby. My parents were friendly with a family called Duffy from Wooler Crescent in Billingham. One of the daughters was a teacher, but I can’t remember where, her first name was Eileen. I was just wondering if she was the same Miss Duffy mentioned in the recent comment by Anne-Marie. The teacher was Pat Duffy and she had a broher living in Delavel Road, Billingham (opposite where I lived in Hardwick Road) with a very pretty and freckled niece called afer her ‘Patsy’, James was her nephew too? He passed the 11 plus when I did in 1966, Sue McGee and I went to the Convent in Hartlepool and I think James went off to St. Francis? I have lovely memories of making my 1st communion in St. thomas’s in 1963, my parents, Maureen (Maddren) and Matt Teasdale were married there in 1954. I attended the school from 1959-66. Mr Eddie Payne was the head, then Miss Gertrude Kernon when Mr Payne moved to St. Michael’s in Billingham. Mrs McRae, Mrs Appleton and Miss Duffy taught me. The best of days… Remember Owen Bowland, Sue McGee, Eddie Salmon, John Hand, Tony & Lawrence Boynton, Veronica Burnham. Pauls grandad who I know as Tom McCabe lived on Samphire Street. We helped him fix a boat up on the river bank at Port Clarence, he used to go fishing on his boat. I was very young at that time, about 12yrs. We lived next door to the Station pub when Pat & Jack had it. My mam & dad were Pam & Arthur Barber and had the house from 1950/1986 – 1 Crosby Terrace. I remember your Family Marc, How are you doing and where are you living now? Are there any Cogan’s in the Billingham area, Norman? My nana was a Cogan and I have documents mentioning the Cogan’s going all the way back to Ireland. You, or anyone who knows me can ask PictureStockton for my email address. My Mother was married in the church, in 1948 I think. She was called Monica Wall (my mother is now 89) and the Walls lived at 2 Eaton terrace until the early 60’s, when my nana and grandad moved to Billingham. I was born in 1952 and spent many happy times over there (I lived in M’bro), playing on the Bendy, just behind my nana’s house. My mother still recalls all the families there such as the Mccabes. and 2 of her sisters married McCabe brothers John and Joseph, another married a James McArdle, another a Patrick Loughlin all at St Thomas’s and all lived in the Port Clarence. Hope you are well! I think I last saw you in Montreal in 1978… Saw Jimmy Kernan for wedding anniversary 2 years ago at Crathorne. Still living in Paris… If you’d like to get in touch email Picture Stockton: pictures@stockton.gov.uk and they will forward on my contact details. I am your cousin, Patricia. My Mam was Elizabeth Murphy. I have very vague memories of you but do recall with great fondness, the time I spent as a little girl with Uncle Con and Auntie Annie. Does anyone remember The White family who lived in Church Street Frederick and Norah White, my mother Margaret was one of 11 children and was born in 1925. I think they attended St Thomas’s Church. I attended St Thomas’ from 1971-1975. Mr Bentley was the Headmaster then and Mrs Appleton taught the infants. I remember writing with chalk on individual blackboards and loved it when we were allowed to go on the little field at the back of Victoria Terrace. Father Stars was the priest then and we went to mass every sunday at 6 o’clock. I left St Thomas’ at 9 years because it was sadly going to be demolished. I still live in Port Clarence but most people I grew up with have moved. My brother-in-law, Brian Cogan, came from Port Clarence,does anyone remember him. Brian Cohan was also my cousin. His mam was my dad’s sister, his name was Tim Murphy. I remember it so well, used to go there with my Nana when I lived with her in Palm Terrace. It was a lovely church. Patricia Maureen Tierney who lived in Billingham 1957/1963 with her aunt. I thank all in anticipation. Hi Chris I have just come across this site as I too am researching my family history. I do believe Maria Kernan would have been my mothers cousin. Was Marias’ mum Mary Margaret nee Devlin and they moved to Port Clarence from Workington? In reply to Fiona McCabe. I remember Maggie and Tommy McCabe. They lived in Samphire Street where I grew up. I think they lived next door to Fitzgeralds. Does anyone recall a John Homes/Holmes and Mary from Port Clarence? Both were scottish and lived there for many years – they were my aunt and uncle. I visited Port Clarence in 2008 and Haverton Hill. I was amazed at the way the area has been run down. The bendy, where we used to play as children, is just a pile of earth. The pub towards Port Clarence is now boarded up – whats happening? My days in Port Clarence were fantastic. I was born there at Victoria Terrace, surrounded by all family ie Fairweathers lived in Queens, Burnhams in Laburnam, Rowdens in the Clarences plus family in Haverton Hill all though family has decreased over years. I always remember the days all us kids together (huge family). Was your mother Teresa Fairweather? she was my cousin. I was an altar boy at St Thomas”s with Shaun, Ged and the other guys mentioned above by Shaun. Great memories of Father Thompson and Father Bedesworth and in general of the local community. Hi Michael I think we are related!. My maiden name was Kathleen Kennedy. Do you have a younger brother called Kevin and Mum and Dad Kath and the late Kevin? I was born and brought up in Haverton Hill attending St Thomas” from April 1958 until we moved to Billingham in November 1960. Like several other contributors I also went to St Joseph”s (“64-“71). My parents, Catherine (Kath Hanna) & James(Jimmy) McDonnell were married in the church in 1952. My mother and her brothers and sisters also attended St Thomas” School. I remember being very frightened making my First Confession facing Fr Beadsworth – he seemed so old! I also remember Fr Marr who was younger and more friendly. One of my main memories of Mass in the church, apart from that it was in latin, was that the men sat on one side towards the back whilst the women and children filled the other side. I was baptised, confirmed and made my first holy communion in St Thomas”s. I made my first holy communion with Ged Hall, Tony Kelly, Brendan Eccles, Francis Keenan, David Pinchen, Kevin Greenley, Neil Wilson and a couple more lads who”s names escape me. There was an equal amount of girls but I can”t remember all their names. Father Bedesworth and Father Thompson were the priests of the day. I was an alterboy at st Thomas”s and also went to st Thomas”s school. I see that the church architects were Pugin and Pugin. would this be the same Pugin whi designed the Houses of Parliment? Fiona Mcabe, there was a Tommy Mcabe who lived in Samphire Terrace. Still at Hartlepool Power Station and playing the blues somewhere cold and damp. As an aside Charles Barry designed the Houses of Parliment with Augustus Pugin advising him on the gothic revival style used at the time. Pugin apparently was the main man when it came to designing Gothic style churches working mainly for the catholic church – Hence St.Thomas. Interesting Eh! I lived in Victoria Terrace from “71 to “77. I attended St. Thomas” school and church. I still say today that I wouldn”t trade my time in Port Clarence for anything, they were the best days of my life. It is very sad to see how it has changed. Love and best wishes to all that remember me! ii was born in high clarence.and attended st thomas school,i have fond memories of all my old classmates and growing up in what was a great place,my parents pat and maurice were from haverton,its so sad to see how its all changed. I”m doing some family history research on behalf of my husband. Paul”s father was Thomas Edward McCabe who left the area as a young lad to join the Royal Navy. His family lived in Port Clarence. Paul remembers visiting his grandfather (also Thomas McCabe)there as a young boy in the late 1950″s/ middle 1960″s but does not recall the actual road name. I note the reference to Eunice McCabe, as she was a sister of Thomas Edward. Any info or memories of the family would be most welcome. I went to St Thomas”s school,made my holy communion there and also was married there on 16/07/1977. My parents Vincent and Winnie Mc Donnell lived in haverton hill and port clarence all thier lives sadly they have both died.I moved to Peterlee with my husband who was a miner but all of my family my two sons and grand children miss visiting Port Clarence my sons had some great summers there and often talk about them. I played football for Port Clarence in the 1940-1950s and Vince McDonnel and his twin brothers played at the same time. Hello to Kath Oyston ne Conlon,I have a lot of happy memories from my childhood in the port.I remember you well,do you remember Moira Carroll,Eunice McCabe,Maureen Fleming,all in our class. I Remember Eddie Tierney as well. My husbands G. Aunt was Charlotte Crooks and she married William Henry Wells in St. Thomas Church on the 14th Feb 1920. Does anyone have any memories of the Crooks/Wells families. The priest at that time was named as C.B. TWOMEY. Does this ring any bells with anyone. Do we have any relations out there that we dont know about!!!! Thomas Muckian and Mary McKenna (Head School Mistress)were married at St Thomas on 16th October 1920. The officiating priest was my namesake, Fr Michael Muckian. I”m curious to know whether Fr Michael was a priest of the parish, or whether he officiated just that time because a relative was getting married. Does anyone know anything about him? I was born and bred in Port Clarence and attended St Thomas”s from 1955 to 1961 when I went to St Joseph”s Convent. Miss Kernan (Gert) was the Headmistress in my day. My mother Ann Appleton taught at the school. My dad Jim worked at Dormans. I remember many family names including Muckian, Tierney, Beedle, Devaney and Golightly many more. Port Clarence was a great community in those days and one I am always proud to say I came from. Hello from NZ. I notice your name is Whitaker nee Appleton. I have been searching for relatives of James Jordison Appleton who died in Stockton in 1921. An Edwin Whitaker schoolmaster was an executor of his will. At the time of his death he had a housekeeper and an illegitimate child. Just a long shot that you may be related in some way. If so can you please reply to me? If you contact Picture Stockton they will forward you my email address. 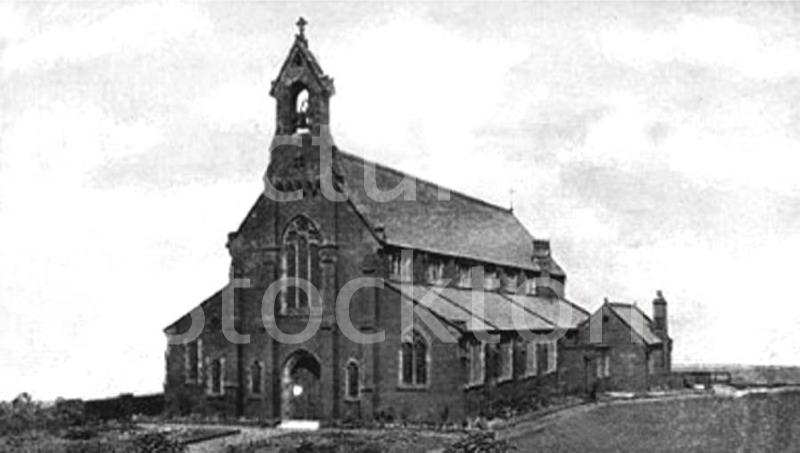 We lived in Haverton Hill but my grandad lived in Crosby Terrace, Port Clarence so St. Thomas was my parish church. I was baptised there, received my first holy communion and was confirmed there. I attended St. Thomas School from the age of 5, that would be in 1951, until the age of 11 when I went to St. Josephs Convent in Hartlepool. My aunty Mary, Mrs Muckian, was the first headmistress at St. Thomas (I think) so education was a strict regime for us. Hello to Eddie Tierney and Margaret Turley, both in my class. I WAS A PUPIL AT ST THOMAS FROM AGE 5 UNTIL I LEFT AT FIFTEEN. SO I MADE MY FIRST HOLY COMMUNION THERE, WAS CONFIRMED AND WAS MARRIED THERE ON OCTOBER 1ST 1966. MY MOTHER WAS THE CARETAKER OF THE SCHOOL FOR MANY YEARS SO I HAVE LOTS OF LOVELY MEMORIES FROM THOSE YEARS. I made my holy communion at St Thomas back in 1976ish. (Father Stars was the priest) My gran (Mary) & my grandad (Mick) attended the church regularly. I attended st Thomas school, which was located next door to the church. Are you from the same Golightly family who was running the pub in Crosby Terrace? I used to attend St Thomas School. I made my first holy communion and was confirmed at St Thomas Church. I attended the school and was confirmed in the church, I believe the seating went to a church in Billingham as for the massive organ that was in it am not sure. It would be nice to find out if anything else survived. Most of my family still live in the Port in Samphire Street which is a stones through from where St. Thomas”s used to be. I was married in this Church on 4th March,1967. It was a lovely old Church. The only reason it was knocked down, was lack of a congregation. The St. Thomas”s School was next to it. I attended that school from the age of 5 yrs to 15 yrs. No Comprehensives then! !.